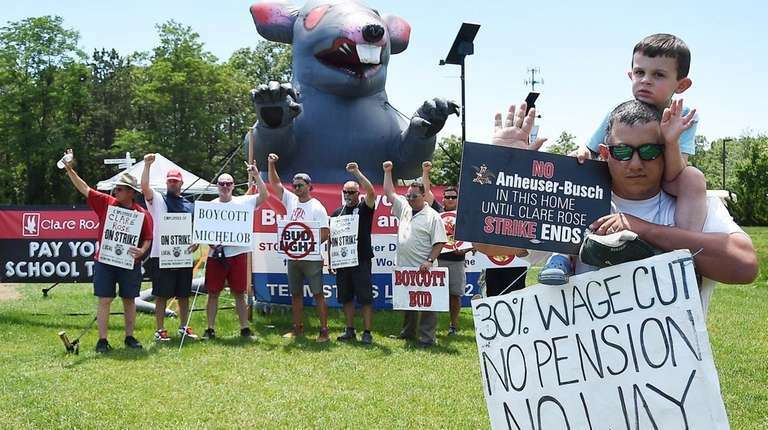 Union leaders and East Yaphank beer distributor Clare Rose said they will meet with a private mediator, as a strike against the company enters its third month. The union and Clare Rose will be working with Martin F. Scheinman, a Port Washington-based mediator and arbitrator, the union said Friday. A date for talks has yet to be determined. Ed Weber, president of Teamsters Local 812, which represents the striking workers and has been seeking a meeting with Clare Rose, said the union looks forward to the talks. “We are pleased that Clare Rose has agreed to reopen negotiations with the union and that the company has accepted the participation of a professional mediator to help us reach an agreement on a new contract,” Weber said Friday in a statement. More than 100 Clare Rose delivery drivers and warehouse workers have been on strike since April 23, following months of unsuccessful contract negotiations. The union has said a contract proposal from the company eliminated a sales function drivers provide, resulting in a 30 percent wage cut. Union members also objected to a proposed conversion from a pension plan to a 401(k) retirement plan. The company has said only a quarter of striking employees would get lower wages under its contract offer, while more than half would receive a raise. Last month, Clare Rose began hiring full-time replacement workers, though “not all positions have been filled” and the distributor is “actively looking to fulfill our staffing needs,” Rose said Thursday. The strike is one of only three work stoppages on Long Island to exceed 60 days in the last 10 years, according to data from the Federal Mediation & Conciliation Service. Teamsters Local 807 workers at Alside Supply Center in Old Bethpage have been on strike since April 1. “Since the 1970s, there’s been a dramatic reduction nationwide in strike activity,” said Gregory DeFreitas, economics professor and director of the labor studies program at Hofstra University. On Long Island, where 1 in 4 workers is covered by a union, “if they do go on strike, they’re striking for very short periods of time,” DeFreitas said. Clare Rose distributes Anheuser-Busch InBev products including Budweiser and Bud Light to 5,000 businesses throughout Nassau and Suffolk counties. According to the union, more than 40 local bars, restaurants and convenience stores have boycotted buying AB InBev products until the strike is resolved.